Read iFOREX forex broker review, rating and detail information for their services below. iFOREX founded in 1996 as iCFD Ltd. It was founded in 1996 by a group of bankers and Forex dealers. iForex was launched online trading platform in 2004. iFOREX is one of the largest and most respected global forex and CFDs broker. iFOREX has also branch offices in Greece and British Virgin Islands. While traders from some countries including U.S., U.K., and Australia is not allowed to open trading account with iFOREX. The broker offers trading services on a wide selection of products such as Forex, index, commodities, shares, and extensive cryptocurrency. iFOREX is regulated by Cyprus Securities and Exchange Commission(CYSEC). iForex also regulated by the HFSA (Licence # III/73.059/2000) in Hungary. iFOREX offered a variety of platform for its traders. They have Desktop, mobile and web-based platform. iFOREX desktop-based application is The Smart Client Platform which requires a download. Furthermore, this platform includes Advanced integrated charts, Customized View, Full Single Screen Function, One-click deal opening. iFOREX Web-based application runs in a browser. For this platform, there is nothing to install because the platform runs in a browser, which may be easier for some traders. Order entry was straightforward and advanced order types like buy and sell limits are available. iFOREX Mobile trading platforms offer similar functionality to the desktop applications. Trader can install it onto their smartphones. The app is free and can be downloaded from Google PlayStore and Apple App Store. Like other major online Forex brokers, iFOREX has no commission for their traders. They allow traders to fully utilize their margin facilities. iFOREX is not transparent with the spreads which they are charging their traders. Also, the spreads for cryptocurrencies were very vast. Please find the below list for different kind of Spreads for iFOREX. iFOREX Supports Bank Wire, Credit Card, Skrill, Western Union, Debit Card and eWallets for deposits and withdrawal. Withdrawals are also imitated through the same methods used for depositing the funds. Customer support at iFOREX is responsive and there are several ways which you can get in touch with the support team such as email, toll free telephone etc. Finally, The searchable FAQ database was very good and easy to use, which may help traders looking for faster answers for some questions. iFOREX is a broker that takes responsibility for its traders. Its educational material is vast and although there is only one standard account, the choice of several different platforms makes trading easy for both novice and experienced investors. More bonuses would be beneficial as well. iForex’s prerogative to charge traders $100 to try out their trading platform, this is not the industry standard. 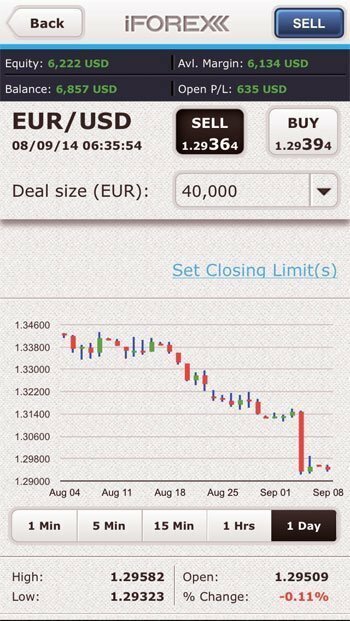 Above all, the lack of a MetaTrader 4 platform is a big negative point for this broker.